Many of us have seen the doomsday charts showing money supply of all definitions skyrocketing over the past few years. These charts alone provide a compelling case for owning gold (NYSEARCA:GLD), as the risk of an inflationary tidal wave taunts us. However, with the bulk of monetary stimulus stuck in a liquidity trap gold investors sit and watch and wait. While the monetary case for massive inflation is still important, there is another, more compelling argument for high inflation. As they say, inflation is a monetary issue. But hyperinflation is a political issue, and politics is inseparable from government budgets. Below I will take a look at a few variables that illustrate the rising risk of hyperinflation and make the fiscal case for gold. The first chart below shows the growth of US GDP and Federal Debt in dollar terms and relative to each other. Besides growing relentlessly over the past several decades, an astute observer will notice that, since 1980, debt has grown faster than GDP and has recently taken on a parabolic ascent. 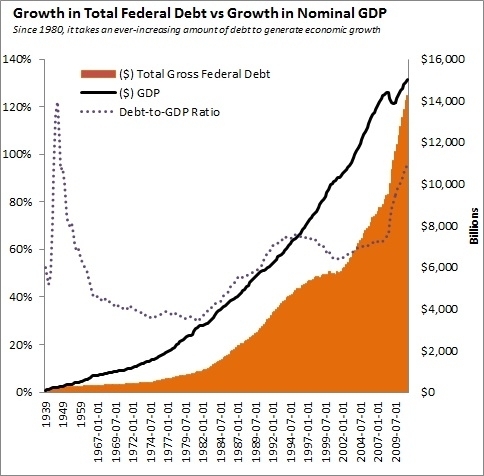 The concept of debt needed to produce GDP is even more clear in the chart below. 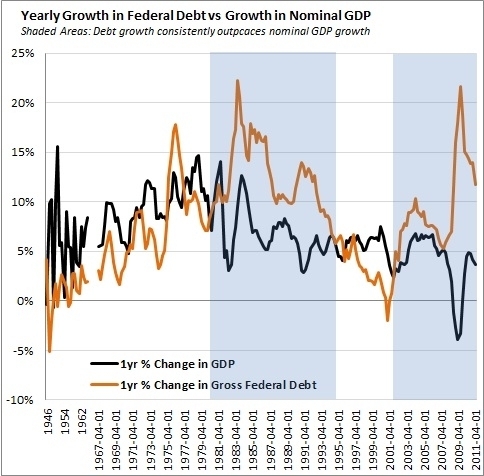 The orange line shows the year-over-year growth in Federal Debt while the black line shows year-over-year nominal GDP growth. Coming out of World War II a heavily indebted US government slowed down the rate of debt growth. During this time the US economy grew faster than debt. Unfortunately, this relationship between debt and GDP didn't last. The shaded areas show when GDP grew more slowly than debt. Since 1980 the marginal return on incremental debt has shrunk. We've had to create more and more debt at a faster pace to generate the same amount of economic growth. Working backwards, debt growth is effectively a symptom of fiscal budgets. 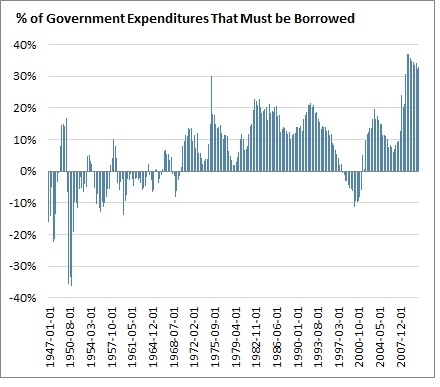 The chart below shows that since the mid-late 1970s the US government has spent more than it has made, resulting in the need for more borrowing. You'll notice the borrow-to-spend tradition began as the US escaped from the restraints of the Bretton Woods agreement - when Nixon ended the gold standard. This enabled the US to run budget deficits to pay for wars and growing entitlements. History has repeatedly shown that when politicians have few restrictions they will spend until a country is bankrupt. Today, one of every three dollars that is spent by the US government must be borrowed. The first question anyone will ask is: why doesn't the US simply cut spending? While this is probably the correct solution, it is the least politically desirable. As we've witnessed throughout Europe, austerity leads to massive social unrest. Any politician who takes money away from special interest groups and government departments is putting a target on his/her back. The chart below is the kingpin of this article in that it demonstrates the growing connection between votes and government spending. 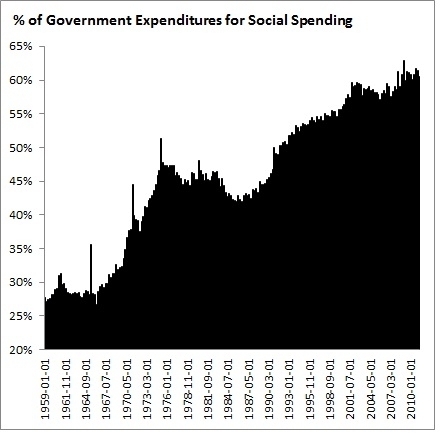 Fully 60% of government spending is a form of social welfare that is paid to the individual citizen. In other words, the government needs to keep making more and more of these payments to keep constituents happy. The US government has backed itself into a corner. There have been 28 episodes of hyperinflation of national economies in the 20th century, with 20 occurring after 1980. Peter Bernholz (Professor Emeritus of Economics in the Center for Economics and Business (WWZ) at the University of Basel, Switzerland) has spent his career examining the intertwined worlds of politics and economics with special attention given to money. In his most recent book, Monetary Regimes and Inflation: History, Economic and Political Relationships, Bernholz analyzes the 12 largest episodes of hyperinflations – all of which were caused by financing huge public budget deficits through money creation. His conclusion: the tipping point for hyperinflation occurs when the government’s deficit exceed 40% of its expenditures. Hyperinflation is the child of fiscal policy, and monetary policy is the plug that fills the fiscal holes. The hyperinflationary wheels are set in motion, but it's not too late to change course. I think that until restraints on spending are evident the bull case for gold (and other metals such as silver (NYSEARCA:SLV), platinum (NYSEARCA:PPLT) and palladium (NYSEARCA:PALL)) remains intact. Bottom line, when a government can't control spending the risks of hyperinflation rise and the case for owning gold strengthens. Disclaimer: This is not advice. While Plan B Economics makes every effort to provide high quality information, the information is not guaranteed to be accurate and should not be relied on. Investing involves risk and you could lose all your money. Consult a professional advisor before making any investing decisions.